As breathtaking today as the day it was completed, Hoover Dam not only shaped the American West but helped launch the American century. In the depths of the Great Depression it became a symbol of American resilience and ingenuity in the face of crisis, putting thousands of men to work in a remote desert canyon and bringing unruly nature to heel. Pulitzer Prize-winning writer Michael Hiltzik uses the saga of the dams conception, design, and construction to tell the broader story of Americas efforts to come to grips with titanic social, economic, and natural forces. For embodied in the dams striking machine-age form is the fundamental transformation the Depression wrought in the nations very culturethe shift from the concept of rugged individualism rooted in the frontier days of the nineteenth century to the principle of shared enterprise and communal support that would build the America we know today. In the process, the unprecedented effort to corral the raging Colorado River evolved from a regional construction project launched by a Republican president into the New Deals outstanding, and enduring, symbol of national pride. Yet the story of Hoover Dam has a darker side. Its construction was a gargantuan engineering feat achieved at great human cost, its progress marred by the abuse of a desperate labor force. The water and power it made available spurred the development of such great western metropolises as Los Angeles, Phoenix, Denver, Las Vegas, Salt Lake City, and San Diego, but the vision of unlimited growth held dear by its designers and builders is fast turning into a mirage. In Hiltziks hands, the players in this epic historical tale spring vividly to life: President Theodore Roosevelt, who conceived the project; William Mulholland, Southern Californias great builder of water works, who urged the dam upon a reluctant Congress; Herbert Hoover, who gave the dam his name though he initially opposed its construction; Frank Crowe, the dams renowned master builder, who pushed his men mercilessly to raise the beautiful concrete rampart in an inhospitable desert gorge. Finally there is Franklin Roosevelt, who presided over the ultimate completion of the project and claimed the credit for it. Hiltzik combines exhaustive research, trenchant observation, and unforgettable storytelling to shed new light on a major turning point of twentieth-century history. "Astutely conveying the characters of its creators, Hiltzik marvelously captures the times of the Hoover Dam." 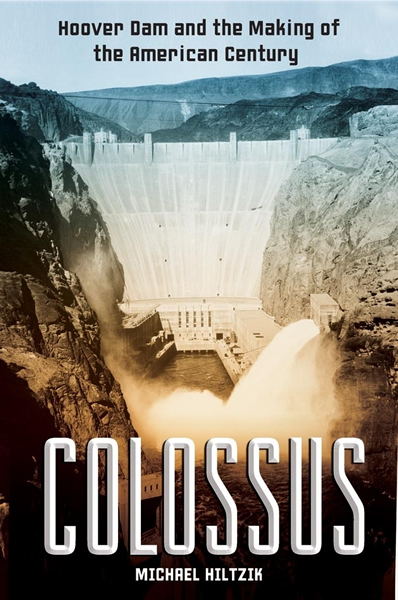 "The parade of grim particulars might make "Colossus" a depressing read were it not for the vigor of Hiltzik's prose and the lively gallery of individual portraits and anecdotes that convey a wonderfully textured sense of what it was like to work on Hoover Dam."